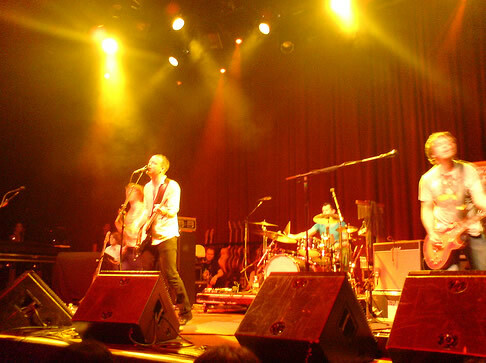 Last Wednesday night I had the good fortune to see Travis at one of only two live gigs they played in America, after their appearance at the Coachella music festival near LA. Like many other British bands, they have a smaller following this side of the Atlantic, which is great as it means they fill far smaller venues than you would expect in Europe, and the fans are more dedicated and appreciative. They played The Fillmore, a historic venue that has played host to a bevy of great musicians and bands over its many years. One room, with some balcony seating on the left hand side, and two rows of chandeliers hanging from the ceiling. I was lucky enough to be standing just in front of the stage, meaning that for this first time I got to see Travis, (a band I have been following since the release of their breakthrough second album ‘The Man Who’), I got to see them close up. They didn’t disappoint. Fran Healy has a enormous amount of stage presence (as you would expect given how long the band have been performing together), and divided the set up with the right amount of interaction with an attentive audience, including a impromptu interview with their keyboardist (his highlight of San Francisco being the diner in which they had breakfast that morning). It was lead guitarist Andy Duncan however, that really made the most of this performance, moving onto the floor during one song to play his guitar solo. This was followed by him climbing the speakers to try hanging from one of the chandeliers. Of course the crowd loved this. There was a good mix of classic songs, and newer material—which totally convinced me to get their next album ‘The Boy With No Name’ as soon as it’s released. The tracks they played from it sounded very much like the Travis we know and love. As an added treat, between the main set and the encore, Fran played a small acoustic set which included the first ‘proper’ song he wrote at the age of 20—appropriately called ‘20’, and then ‘Flowers in the Window’. This was really special, as he performed it without any microphones to a silenced crowd. I’ve never seen this done before, and only possible at a small venue like this one. The band ended the night with their classic ‘Why Does It Always Rain on Me’, to which Fran got the whole venue (including the bar staff) to pogo during the chorus—‘as it makes you happy’. It certainly did, and I left The Fillmore with a huge smile on my face. This was easily the best gig I have ever had the pleasure of experiencing, and will definitely go down as a highlight of 2007.